For a dead guy with unfinished business, he was pretty cute. Fiona is a completely ordinary fifteen year old from Canberra… at least that’s what she’d like you to think. She doesn’t want anyone to know her secret. She can see and touch ghosts and it’s all thanks to her pesky twin-sister Ella - who happens to be dead. Read the first three chapters here for free! The Ghostly Grammar Boy was awarded a five-star rating from the professional reviewers at Readers Favorite Website. Hannah was a bully when she was alive… she’s even worse now that she’s a ghost. Fiona is back. She’s got a hot new boyfriend and the grudging respect of the popular group. She even has a confidante who knows her supernatural secret. This is a romantic suspense novel still in progress, due for completion July 2015. The book is about Hailey, a ditzy Californian girl, who leaves her disastrous love-life behind for a high-flying job in Tokyo. 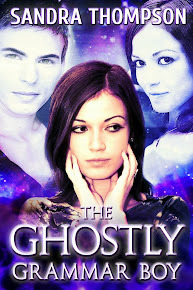 Hailey struggles to settle in, but the trouble really begins when she meets a handsome foreigner with a secret agenda. Keep checking back here for more information and sneak previews.